For almost 20 years our customers have enjoyed award winning seafood, slow roasted prime rib and fresh Maine lobsters served by a friendly and professional staff. 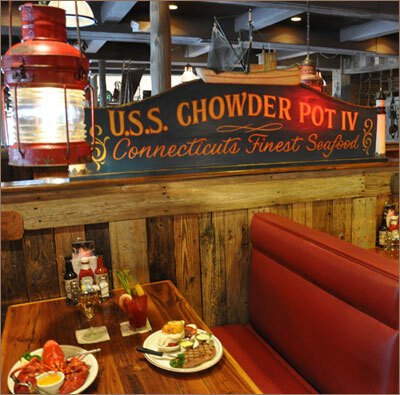 The Chowder Pot of Hartford has seating for 320 people in two nautically decorated dining rooms with accommodations for groups of up to 25 people. Our Captain's Lounge features a Raw Bar & Happy Hour, M-F 4:00 to 6:00 as well as full lunch and dinner menus served by our bar staff. For larger private parties there is The Promenade Ballroom a 10,000 square foot banquet facility offering the seafood and prime rib that has made The Chowder Pot famous. We provide the same great service for corporate events, holiday parties or weddings. Conveniently located off route 91, only minutes from downtown Hartford, XL Center and Connecticut Convention Center. Stop by and pick one of our live lobsters from our tank for dinner tonight! The best Lobster Bisque in New England!!" The restaurant was fun, the interior is designed like a boat. I had the Lobster Bisque and Seafood Imperial - it was so good, I've been craving the bisque ever since I left!! Oh, and get the squash, it was like dessert!!! The server was great and the food was served hot!! !